The Xbox One X - How Does it Hold Up Against the PS4 Pro? A look at how Microsoft's new 4K console holds up against the PlayStation 4 Pro. Microsoft has been playing catch up ever since the PlayStation 4 Pro launched with more power than the Xbox One. Not only did it offer more power, it also had the added bonus of being significantly cheaper. Following the Microsoft press conference at E3 2017, we know the Xbox One X (Project Scorpio) is scheduled to release on November 7th, and that it aims to cement itself as the penultimate gaming rig. With the price point of the Xbox One X set at $499 in contrast with the PlayStation 4 Pro, which comes in at $100 dollars cheaper at $399, we’re left to wonder why there continues to be such a wide price difference. While the PlayStation 4 Pro entered the market as the more powerful option, it now has to rival the Xbox One X, which is stocked with more computing power (30% more), more memory, and more memory bandwidth. The raw graphical capabilities of a console are measured in TFLOPS. Currently, the Xbox One X sits at 6 TFLOPS, whereas the PlayStation 4 Pro comes in at 4.2 TFLOPS. As such, Microsoft’s newest console is miles ahead in terms of power and performance. Then, you have to take the higher memory bandwidth into account with the Xbox One X featuring 326GB/s and the PS4 Pro around 218 GB/s. In addition, the Xbox One X has upped the VRAM threshold with 12GB versus 8GB included in the PS4 Pro.The only place the two consoles come close is their processors, with the Xbox One X boasting an eight-core processor that clocks in at 2.3 GHZ, and the PS4 Pro’s eight-core processor giving us 2.1 GHZ. Specs aside, Microsoft topped their announcement of the Xbox One X by giving gamers a glimpse of the console’s raw power. Games like Forza Motorsport 7 look spectacular on when played on the Xbox One X using a 4K HDR TV. Here, Forza’s dev team showcased their own skills by using photogrammetry to capture the picture perfect images of each track’s surroundings, and it really does look glorious. With all of this in mind, the Xbox One X doesn’t just hold the key to photorealistic imagery. It also allows developers to explore more cartoonish graphics like the co-op Sea of Thieves, or Minecraft. Minecraft in 4K never looked as amazing as it has before with their “Super Duper Graphics Pack” designed for the Xbox One X. The new graphics pack sports massive draw distances, realistic lighting effects, and high resolution textures. Now, it bears mentioning that everything stated above is earmarked with the necessary 4K HDR TV set. If you take the same games and plug them into a smaller tv, it just doesn’t live up to the former sense of grandeur. The resolution and image quality suffer on the Xbox One X when tethered to a tiny viewport. You’ll get massive draw distances and steady framerates, but nothing will look or feel as brilliant as it does on the big 4K HDTV big screens dotted around the show floor. As with the PlayStation 4 Pro, all that hardware won’t do you any good if you have a 1080p TV with no HDR at home. It’s not exactly Microsoft’s fault, though, as they have no way of controlling how people will experience the Xbox One X at home. However, why would we want the Xbox One X if we can’t replicate the spectacle? It’s going to come with the same games as the cheaper versions and it’s going to have the same accessories. Not to mention the fact that it doesn’t offer VR on launch like the PlayStation 4 Pro offered with PSVR. They’re not even changing the interface on the new Xbox One X. Instead, everything will be a unified experience for $300 dollars more than the $199 Xbox One S. If you have a 4K TV, you have less of an entry barrier when thinking about purchasing the Xbox One X. 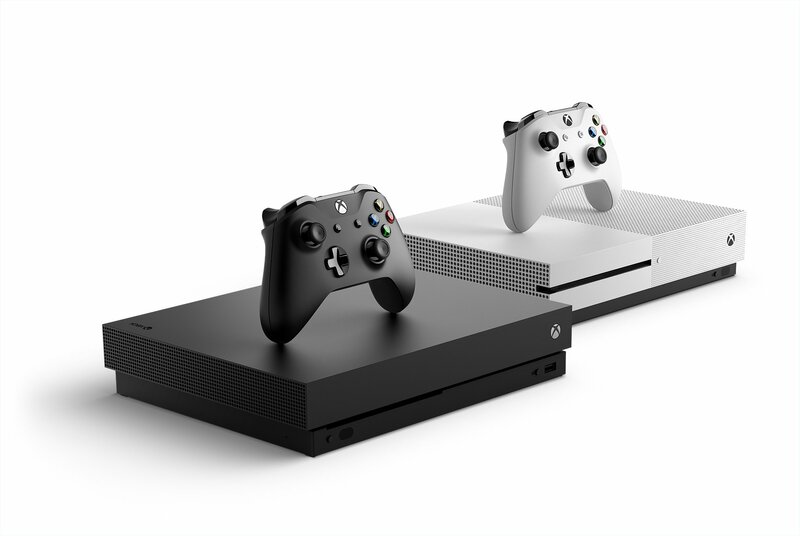 The prices have gone down significantly for 4K televisions, and when paired with a beautiful sound system, the Xbox One X is a worthy luxury console. In terms of power and overall presentation, it’s worth considering the Xbox One X over the PlayStation 4 Pro. If the offering of games appeals to you, it will no doubt be an amazing 4K gaming experience.